Don’t you just hate it when you get ready to make the dish you’ve been planning for days, only to find that you are out of a certain item? Or, how about when you forget to take the butter out for it to get to room temperature? 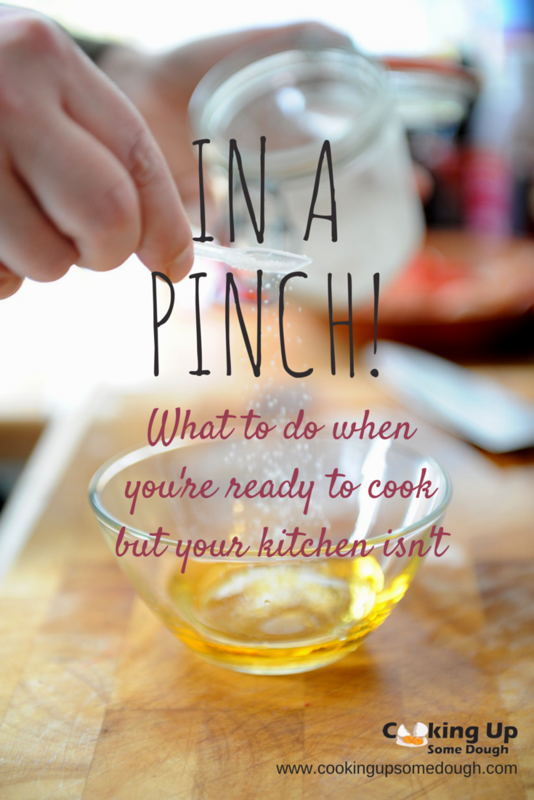 I have to admit, most times that I’m in a bind in the kitchen, I just haven’t prepared ahead. Sometimes that means that I haven’t read the recipe ahead of time or I’ve decided at the last minute to cook something that sounds good but I haven’t shopped for. 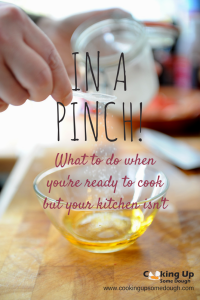 Here are 5 kitchen hacks for those “in a pinch” moments. Unless you bake often, it is quite possible that your baking powder has been sitting in your pantry for a long period of time. It’s a good idea to test the effectiveness of that powder so you see that majestic rise in your baked goods. To test, mix 1 teaspoon of baking powder with 1/3 cup of hot water. If the baking powder is fresh, you will see lots of bubbles. If not, it’s time to replace. If you find yourself with inert baking powder, for every teaspoon of baking powder needed, substitute ¼ teaspoon baking soda plus 1 teaspoon white vinegar as a replacement. The baking soda should be added to the other dry ingredients in the recipe and the vinegar added to the wet. You will not taste the vinegar. If your recipe already has baking soda, yes, you do add the additional baking soda. The reaction of the baking soda and vinegar will begin to take place as soon as you combine your ingredients and will be short-lived so wait to mix your batter until just before you begin the cooking process. If refrigeration is needed before baking, there should be no adverse effects. Your first thought might be to microwave the butter but getting it to the perfect softened stage without melting it can be tricky. A better solution is to freeze the butter for a few moments and then grate it into a bowl. Cover with plastic wrap for 5 minutes. Remove the wrap and its ready to use. 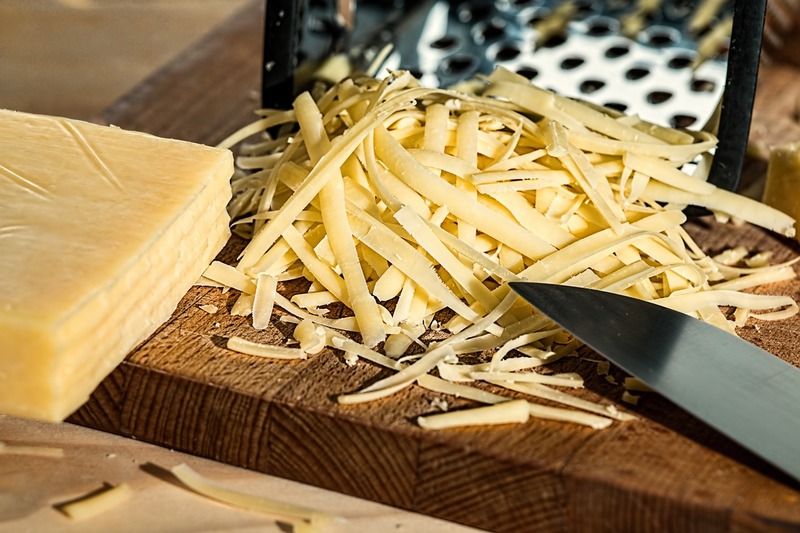 Grate frozen or hard butter to soften it quickly for use in baking. Besides being a nuisance to work with, dull knives can be dangerous. If you don’t own a knife sharpener, just grab a coffee cup and pull your knife blade across the unfinished ring on the bottom surface at a 45-degree angle several times. Check out this video tutorial to see how it’s done: How to Sharpen A Knife With A Coffee Cup. 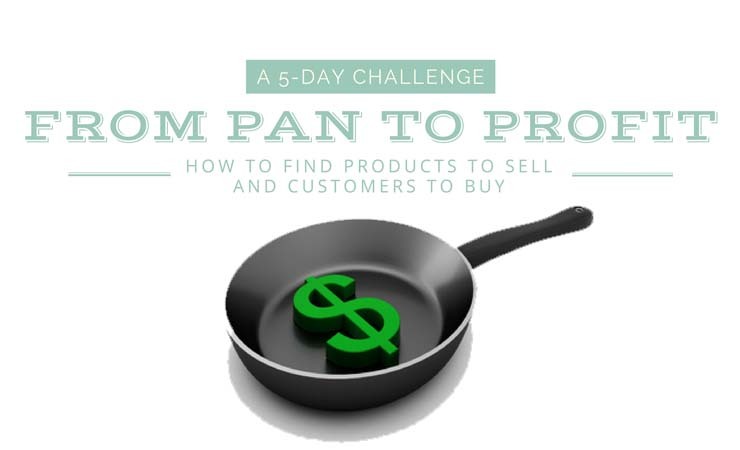 Most of us keep just one type of flour on hand for our everyday needs – all-purpose. The name says it all. For those times that baking calls for special flour, there’s no need to panic. Just mix up the flour you need. Self-Rising Flour – For every one cup of self-rising flour needed, measure 1 cup all-purpose flour, add ¼ teaspoon salt and 1 ¼ teaspoon baking powder. Whisk ingredients together then sift 5-6 times. After sifting, measure the amount needed for your recipe. Cake Flour – For every cup of cake flour needed, spoon 1 cup of all-purpose flour into a measuring cup, level off, then remove 2 tablespoons (put it back in the container it came from). Add 2 tablespoons of cornstarch to the measured flour. 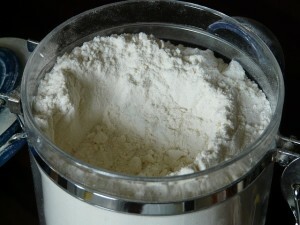 Sift 5-6 times and it will be ready to use as cake flour. Don’t forget to re-measure your final product before using since the sifted amount may be different than what you started with. If you’re anything like me, you always have lettuce in the produce drawer but sometimes get tired of eating salads. If it’s been a few days since you last looked at your lettuce, it could be limp. To get it rehydrated and crisp for use, fill a large bowl with ice and cold water and add the juice of 1 lemon (about 3 tablespoons) or 1 tablespoon of apple cider vinegar. Plunge the lettuce leaves in the water and soak for 20-30 minutes. The mixture should bring new life to your lettuce. Remove the lettuce and dry the leaves before using. What are some other problems you run into in the kitchen? Let me know in the comments below. I’d like to make this a regular series. Maybe we can work on a solution together.